I have seen users asking lately about searching their hangouts chats as well as having the ability to email the transcripts. I myself have been wondering about searching your chats. After a bit of playing around I have figured out how this can be done. Currently there are no search capabilities in Hangouts, whether desktop app, extension, plug in, or mobile app. However all of your hangouts are saved in Gmail under a label called Chats which you can see on the left. So the quickest and easiest way is to navigate to your Gmail at mail.google.com and click on Chats on the left to see all o your chats. The results will be broken out by day, but if you open one you will be able to scroll up to continue seeing the prior history. Lets say you want to find a chat with specific words, just enter in the search is:chats xxxxxx or in: chats xxxxxxx or label:chats xxxxxxx. Here is my example using the search word "gotcha". Lets say you wanted to email the content of a chat. This is possible, however it is limited to just one day at a time. So using the search technique above, find the chat you want to email and open it up. On the right of each day you will see a little drop down arrow that allows you to add a Gmail label, Reply to the members of the hangout via email, forward the content of the chat or Print. The limitation here is that it will only apply these actions to that particular day's chat content. Anyway, thought this might be useful for some of you. Please note: this is for Gmail web only, not Inbox and not mobile. This is only applicable if Conversation View is ENABLED (or turned on) within the Gmail settings. If Conversation View is DISABLED (or turned off), then you get each distinct chat message ONLY, not a full day's worth. Nevertheless, I've determined I can always temporarily go enable Conversation View, long enough to do the Hangouts searching the way I need (for emailing, etc.) and THEN turn it back off when finished (I don't use Conversation View). Good catch and thanks for the clarification. 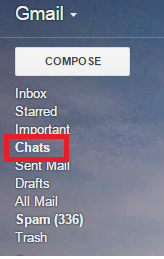 My gmail only has the other parties chats, what i have typed isnt there. Why? I am not sure why you are seeing it that way, are you looking at the Chats category on the left? i am using hangout on my iphone how can i see my hangout messages on my gmail account.